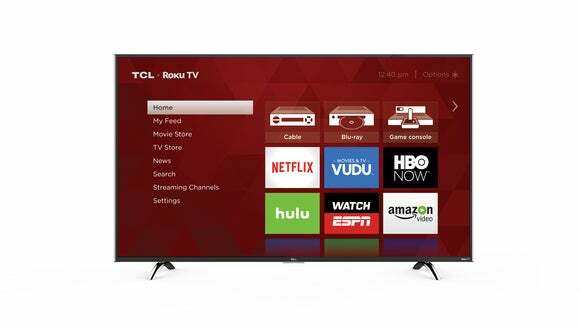 While picture quality is merely good by rapidly improving LCD TV standards, TCL's P-series Roku TVs are a breeze to set up and use. With most TVs, you get the feeling that the on-screen interface used for set-up, tweaking, and browsing the apps and features was cobbled together by part-timers with only the vaguest sense of, well, what makes sense. With TCL’s P-series Roku TVs, you get the idea that there’s intelligent thought behind the interface. That’s a complement to both Roku and to TCL for wisely licensing Roku’s technology. This truly is one of, if not the easiest, TV user interfaces to navigate. Even the parts that are still TCL’s design. Having Roku on board also takes care of the streaming capabilities nicely, with about 3000 channels. Ever done the math on how long it would take to surf 3000 channels? About four hours, given 5 seconds a channel. Better to make use of Roku’s excellent search function and 4K UHD spotlight channel. For tire-kicking purposes, TCL provided us with its $600, 50-inch model 50UP130 for this review. 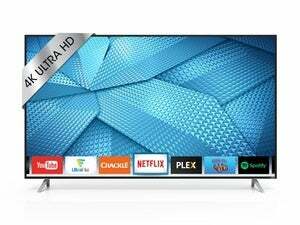 P-series prices start at $500 for the 43-inch 43UP130 and top out at $1100 for the 65-inch, 65UP130. All models feature 4K UHD (3840x2160 pixels), 60Hz displays with 10/100 ethernet, 802.11ac Wi-Fi, and four HDMI ports. There’s also a slightly cheaper UP120 series available with a more basic remote that doesn’t include a headphone output or voice navigation. Side view showing the TCL P-series Roku TV’s ports. There are four 60Hz HDMI 2.0 ports with HDCP 2.2 support for copy-protected 4K UHD content (one HDMI port supports ARC). When TCL first showed me the P-series TVs, I figured that because of the price, HDMI would be a mixed bag. Nope. All four ports are 60Hz HDMI 2.0 and support HDCP 2.2 copy protection required to play commercial 2160p content. One HDMI supports ARC (audio return channel) for driving a sound bar or the like, which you’ll probably want—the 50UP130’s sound is average at best. There’s also RCA analog audio as well as composite video in. There is, however, no component video input. Besides HDMI ARC, you can also output audio via RCA or optical S/PDIF. A USB 3.0 port lets you load media from a thumb drive. 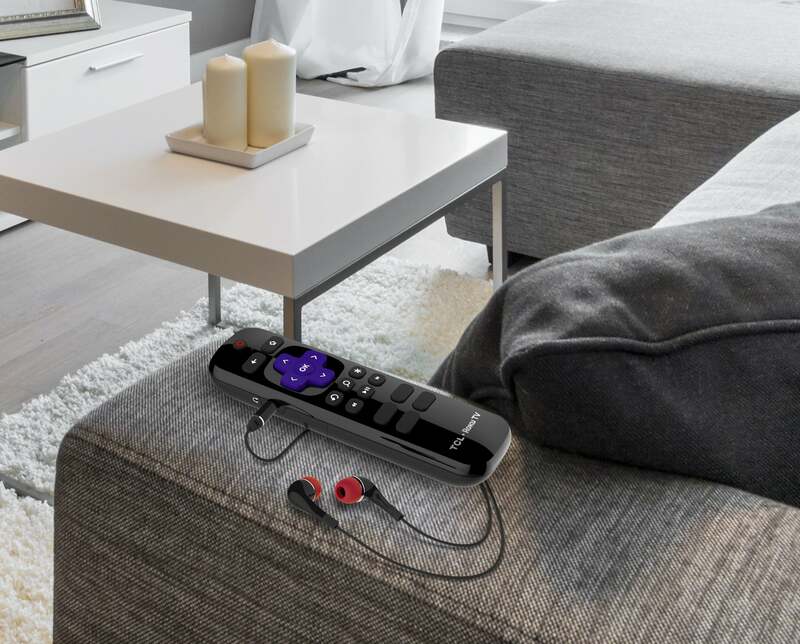 Anyone familiar with Roku’s streaming boxes and sticks will find TCL’s P-series remote to be quite similar. It’s small, simple, and just enough different from the Roku to make you pause. There are a couple of buttons that are different, but as buyers are likely to be Roku newbies, or ditch the standalone box for the in-set service, it’s a trivial concern—especially as there’s headphone output and voice nav. I also loved the way the remote just paired up without a lot of fuss or bother. The Roku TV’s remote is very much like Roku’s own—simple and easy to use. It also sports a headphone jack and mic for voice navigation. One of my favorite TCL features is the button on the back of the TV that will cause said remote to start beeping so you can locate it. Even better, should you so thoroughly misplace the wee beastie that you can’t hear it beep (or its battery is dead), you can use the Roku app (there are versions for Android and iOS) to control the TV from your smartphone or tablet. Having been spoiled recently by the new HDR/color-improved LCD TVs that are this year’s big news, it’s a bit difficult to rein in expectations when a new TV drops in. By last year’s standards, and any year’s budget standards, the 50UP130 has a darn good picture. Compared to state-of-the-art TVs…. But at one-quarter the cost, I shouldn’t be making such comparisons. The 50UP130’s color is more accurate than I’d expected for the price, with only slight leanings to lime (greens) and orange (reds). The contrast is decent, and the overall viewing experience quite pleasant with most material. 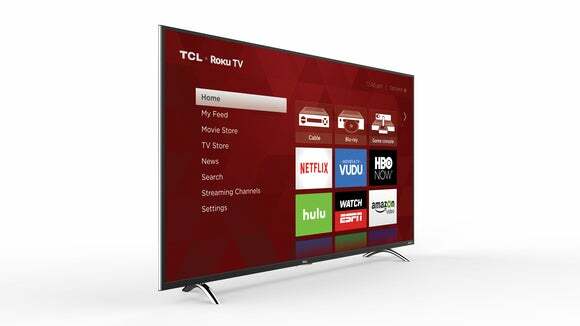 All the usual streaming services are present and accounted for on TCL's Roku TVs. The full-array backlighting is surprisingly good, despite there being no local dimming to help bring out the blacks. There was no significant blooming or bleed from the edges, and with the settings at a reasonable level, with a pure black image displayed, it got somewhere into deep charcoal gray. That’s actually pretty good for a budget LCD TV. But with the settings maxed out and the image unusable, we’re still only talking 311 nits. This is not the TV to use in really bright spaces. Sharpness and contrast are decent enough, but the P-series doesn’t perform particularly well with motion and detailed panning shots. I’ve seen worse at 60Hz, and there are minimal artifacts with large single objects in motion. But in scenes with lots of figures in motion, or pan shots with lots of detail, there was some stutter and shimmer/moire with 2160p material where the level of details exacerbates such things. It hardly spoiled the deal, but I get paid to tell you such things. The 50UP130 set up channels rather more quickly than I’m used to, and changing them wasn’t as laborious as with some other budget TVs. The P-series also does a decent job upscaling 1080p content. Overall, I’d rate the viewing experience as good, with the caveat being the motion deal. TCL provides an app for playing back media from USB drives. It handled nearly all the audio formats I threw at it, including Apple Lossless and FLAC. It also easily handled HEVC (h.265) video and standard MPEG, as well as the most popular image formats, such as PNG and JPG. But then things went a bit wonky. Contrary to the claims on its website, the 50UP130 would not play a number of the AVC (h.264) 2160p files I fed it, and it also wouldn’t recognize drives formatted exFAT, or any drives beyond a certain size. It was fine with the 1-, 4-, and 8GB thumb drives I used (these were formatted FAT32 or NTFS), but it wouldn’t recognize either a 1TB hard drive a 2TB SSD. I didn’t have a lot in between available to me, but I’m guessing you should be okay to at least 32GB. TCL was short on the actual details when I inquired. The poor AVC support is the biggest issue for me, simply because nearly everything I’ve ripped or downloaded uses the format—including a large number of my test files. It’s a very, very common format for video files. The sound emanating from the 50UP130 didn’t blow me away. There’s no bass to speak of, and the clarity is merely livable. I definitely recommend using a sound bar or some other type of audio reinforcement with this unit. TCL's P-series are impressive TVs for the price. But motion and panning are weaknesses, and there’s iffy support for h.264 files on USB media. While TCL doesn't have the brand recognition of a Sony or even a Vizio, the company ships the third-most TVs in the industry. Now that’s largely in China, but the point is that they’re hardly new to the TV biz. I was quite impressed with the fit and finish of our test unit. It doesn't look or feel cheap, despite the fact that it weighs a mere 27-something pounds. 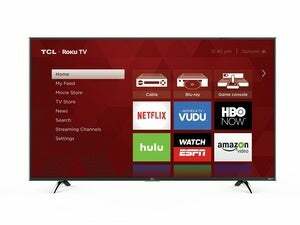 Bottom line: TCL's P-series Roku TVs are a great value for the money. You couldn’t ask for a better out-of-the-box experience, user interface, or remote. The picture is merely good, and motion handling a bit weak, but it's great to have Roku on board. This TV is definitely worth a look see if your funds or enthusiasm for spending large on a TV are minimal. 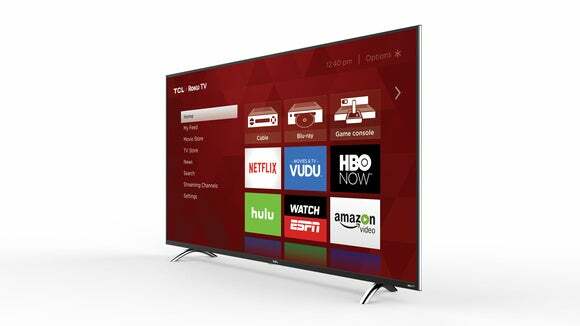 TCL's P-series Roku TVs provide a luxurious, intuitive interface experience by anyone's standards. The picture is nice within its non-local-dimming, non-HDR limits but suffers minor motion stutter and panning shot artifacts. 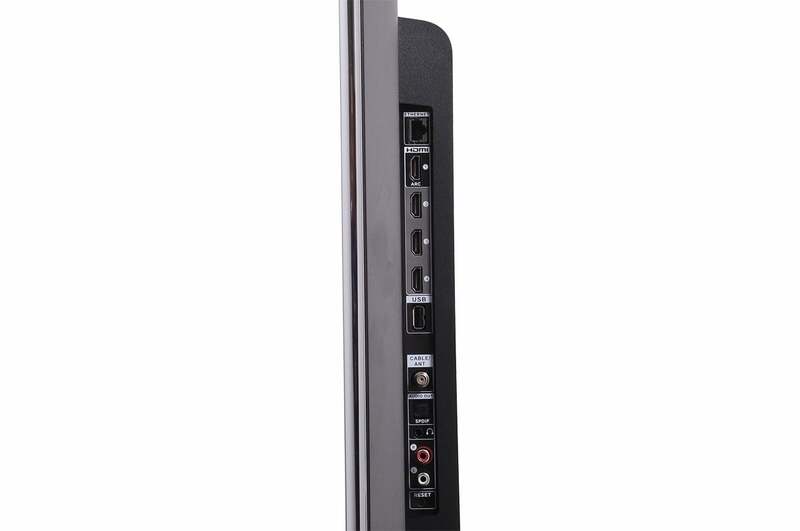 Connectivity is state-of-the-art with ethernet, 802.11ac Wi-Fi, and four HDMI 2.0/HDCP 2.2 ports. HDMI 2.0/HDCP 2.2 support for all four HDMI ports.